This map of Eastern Turkestan can be found in appendix to A Desert Journal: Letters from Central Asia (1934) written by the British missionaries Mildred Cable and Francesca and Evangeline French. This map illustrates the main trade route across the Gobi Desert from the Kansu region located north of Tibet and marked to the southeast of the map, stretching to the northwest through Mongolia and Sinkiang. Most geographical information is concentrated along this strip, marking cities such as Kanchow, Suchow, Hami and Urumchi, as well as smaller towns and villages along the trade route. Rivers and lakes are illustrated, as well as parts of the Great Wall of China. 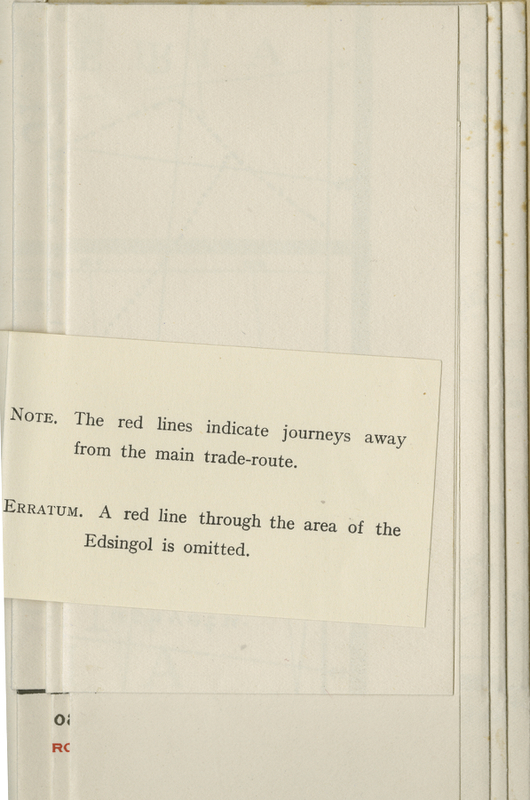 Red lines marked along the main trade route indicate the routes followed by the authors. 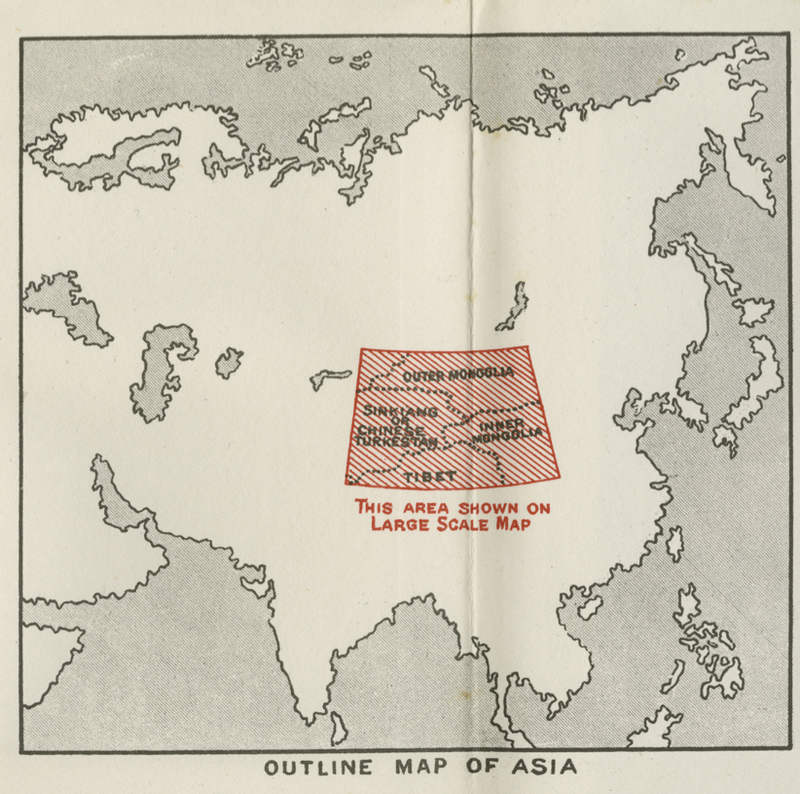 An additional large-scale map outlining East Asia on the Asian continent can be found in the same volume. 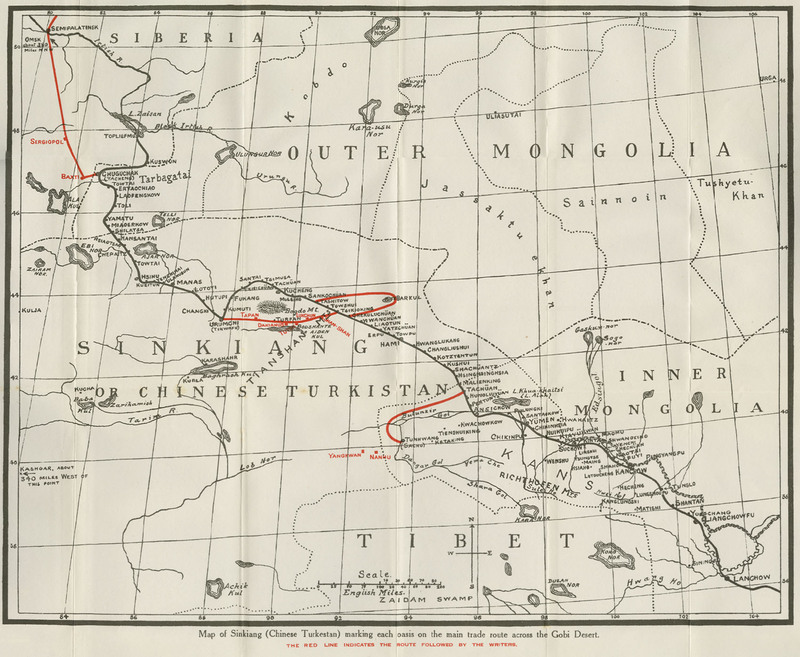 Note that this is the same map as “Map of Sinkiang (Chinese Turkestan) marking each oasis on the main trade route across the Gobi Desert” from the book Through Jade Gate and Central Asia: an account of journeys in Kansu, Turkestan and the Gobi Desert (1927) written by the same authors. However, the travel routes followed by the authors differ in the two maps.